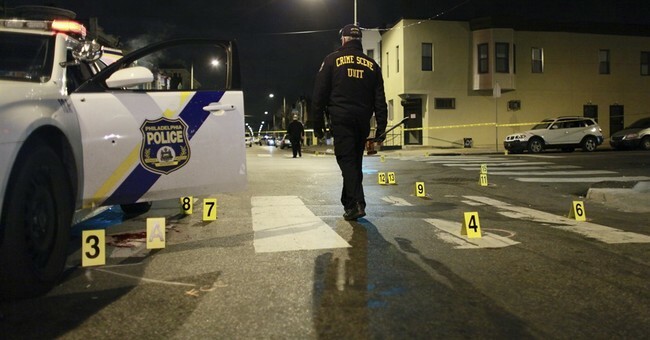 A police officer in Philadelphia is in stable condition after a gunman ambushed him while he was sitting in his cruiser. Police Commissioner Richard Ross said the suspect fired 13 shots that hit Officer Jessie Hartnett and his car late Thursday. He said the officer returned fire, hitting his assailant at least three times. Hartnett was in stable condition. The suspect has been arrested. A motive is not yet confirmed, yet some sources are suggesting it was done in the name of Islam because the suspect was reportedly wearing Muslim attire. A local ABC News affiliate has some chilling surveillance images of the shooting. Hartnett, who is 33 and has been on the force for 5 years, was shot at 13 times. Three bullets hit him in the arm. At a press conference Friday afternoon, Philadelphia Police Commissioner Richard Ross revealed the suspect is a 30-year-old who admitted to committing the cowardly act in the name of Islam. Police also acknowledged that Hartnett's bravery likely saved his life. Despite being shot multiple times, he exited his vehicle and ran after the shooter. "This could have easily been a police funeral," Ross said. The most unfortunate piece of information, he added, was that the weapon used in the shooting was a stolen police firearm.